Manila, Philippines - Irked Quezon City Mayor Herbert 'Bistek' Bautista slapped an arrested Chinese drug dealer after the suspect refused to answer some of his questions during a buy-bust operation on Friday in Philcoa, Quezon City. According to reports, the authories had seized 10 bags of suspected illegal drugs with an estimated street value of P15 million. When Bautista asked the suspect, with name identified as Xu Zhen Zhi on his driver's license, where he got the drugs, Xu gestured with his hand near his ear to indicate he could not understand his question. "You cannot hear me? You cannot understand me?" Bautista said. A video on the incident showed him slapping the suspect a second time. 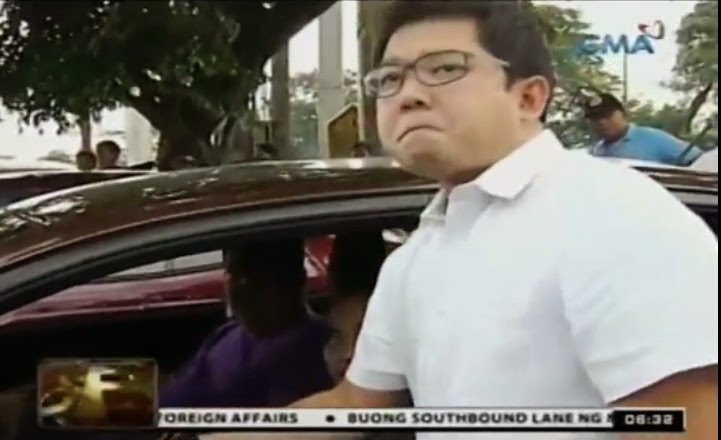 Before the slapping incident, Bautista was surprised by Xu as he posed with him by sticking his head out the window of his car. On Saturday, Bistek apologized for the incident. "Gusto ko talaga mag-apologize dahil hindi naman talaga ako 'yan, that is not my character," he said, in an interview on GMA News TV's "Balitanghali." According to the Commission on Human Rights (CHR), "any maltreatment of...persons detained for investigation and of the convicted prisoners is an outright defiance to the Declaration of the State Policy under Article II, Section 11 of the Philippine Constitution." The constitution says "the State values the dignity of every human person and guarantees full respect for human rights." Bistek also apologized to CHR chairperson Etta Rosales and said: "Hindi talaga ako ganoong tao, hindi ako nananakit."